There were a couple of contests running during the SL Clothing Fair. The SL-Newspaper.com Contest was for merchants who decorated their shops in a Pirate theme. I know I saw a lot of great theme decor and even wrote about it last week. 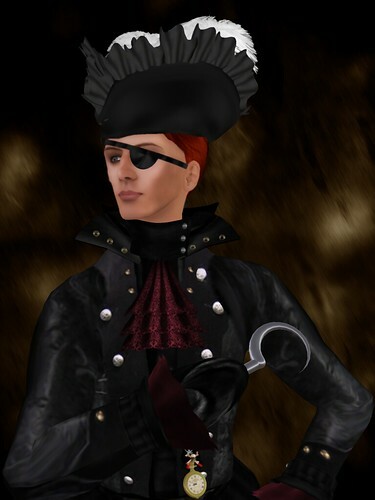 The photoLife photo contest was for the best outfit and picture made using the RFL vendor objects. There are a lot of great snaps in the flickr feed and I had a great deal of fun looking around for items that would go together. Winners get a photoLife Studio and designer gift packs. Winner for female: Elusyve Jewell with RFL Clothing Fair 2009 (2) !! Winner for male: Pirate Lord Nelson….Ran Garrigus!! But the real winners are those people who will be helped by the 4.5 million lindens raised during this fabulous event. Thanks to the unflinching efforts of the Relay Raiders, the designers, the builders, entertainers and — most importantly — all of you who came down and gave your linden dollars to the cause we’re that much closer to a cure. And I think that makes us all winners. Posted on March 23, 2009, in Fashion Events. Bookmark the permalink. 2 Comments. The amount of money raised for American Cancer Society is amazing – Honestly, when I heard that amount at the awards bash – I thought it was a joke! Certainly, all did a fine job, it was a fun, smooth event, and the money goes to a great cause – the 25th anniversary of the RFL / American Cancer Society – Hope for a Cure and the first RFL Clothing Fair – Awesome! Just goes to show there are so many creative people behind the avatars we see. The people behind the avatars know that together we all made a difference.